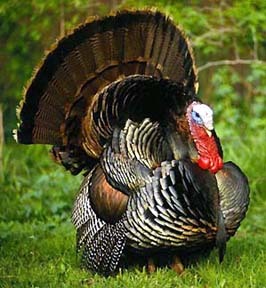 I found this magnificent creature while searching for Thanksgiving-related images. Is this what they really look like before? Spurs Magazine is about provoking thought and action. I think I'll have tofu next Thanksgiving. One of our goals at Spurs is to enhance your experience of life by highlighting what is truly good and enduring. Food's close enough. We have a stupendous, wonderful, awe-inspiring food section in development as I write. One that will feature an actual Culinary Academy trained, professional Chef. And original photographs of food, too. Our food section will be that good, in a less compulsive fashion. I want to clear something up right nowmany of you may have returned to this page again and again, for yearswaiting for the transformation of this collection of recipes into a comprehensive culinary resource. We've been stalled at "Only the beginning" for quite a while, I'll admit it. You deserve to know what happened. Our chef, who also happens to be my son, is a real chef, a graduate of the California Culinary Academy in San Francisco. He's worked for a four-star restaurant, an exclusive supper club and catered the best parties. Plus, he made me a killer dinner on my sixtieth birthday. We discussed making this page into something remarkable, writing cookbooks together, and just cookin', generally. When I suggested that he give me a few recipes to kick-start the effort, he nodded gravely, then withdrew into silence. After a while, he said, "We should start with stocks." If you're like me, you immediately thought of those really nasty, big, heavy wood and iron things that our ancestors used to put our other ancestors in to humiliate them publicly. Remember, pilgrim times? 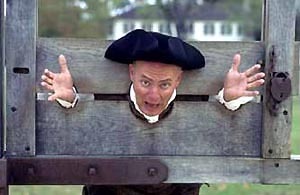 They used to put people in the stocks in the middle of the town square to shame and degrade them without killing them. While I was thinking about humiliation and pain, my son said, "Yeah. A nice beef stock. Or a fish stock." Stock is the liquid left over after boiling (simmering) various animal skeletons with vegetables, herbs and spices. It takes really a long time and is basic to any elevated cuisine. Well, that was too elevated for me. To me, microwave cooking is too much work. I could see that we had a problem. My son wanted to actually teach you to cook, and do it right. I just wanted something to eat that tasted good and didn't take all day. I've been busy, okay? It's been fun, too, writing those books and getting them ready for you to read. Did I mention the books have won seventeen national awards in literary contests? My son is off on great adventures. Eventually, we will get our recipes together. In the interim, here are some of my recipes. Our in-house art department has worked up illustrations that you'll never see in any magazine, either. They feature the Nathan family kitchen, not some designer's set. The recipes presented below are kitchen tested and meet exacting quality standards. (That is: My husband will eat them.) They have been stolen from some pretty fancy places, which I will acknowledge when I remember where I filched them. My attitude toward the culinary arts can be summed up in one short sentence: "I'd rather shovel manure than cook." This may seem somewhat negative for someone presenting a food page, but it's true. And the recipes don't care how I feel, they're good anyway. I created this recipe because we drink a lot of chai around here. You can drink chai hot, or chilled. You can put it in a container and stick it in the refridge for a long time. You can even take it to pot luck dinners. (More on this later.) This is how I make it. Okay. Turn the water down to "low" or "simmer". Slice about 16 thin slices off your fresh ginger, throw it in the water. Put "a small handful" of whole cloves in the water. That's about 25. Put "a small handful" of fennel seed in the water. About 1/2 teaspoon. [10/8/07 News flash! Since writing this article several years ago, I have instituted improvements. I have chucked the fennel seeds in favor of star anise. I throw a small handful––a tablespoon full?––of star anise hunks into the brew. I have also gotten way looser about my spice quantities, doubling, tripling, whatever. Don't be afraid, readers! The worst you can do is make something that tastes terrible and wastes your money! No. I've found I like things spicier as I age, probably due to the inability of my old senses to register anything less than gustatory sledge hammer blows. Take about 14 cardamom pods. This is the tricky part: Without slicing your fingers off, split the pods and open them. This means: Stick the point of a knife in each pod, piercing it's shell. Simultaneously, twist your wrist and flatten the pod, so that it's opened and the flavor of the little seeds inside can get in the water. This place is serious fun! Put the split pods or the cardamom seeds in the water. Simmer the spices for 5 minutes to several hours. If you forget and go on vacation or something, just make sure the pot is still 3/4 to 7/8 full when you continue the recipe––add water. Also, if you let it go for hours, the chai may develop a greasy, terrible looking scum on top. Don't worry. This tastes okay. You can also skim it off. When the tea is steeped, add milk. Just fill your pot to the brim with milk. I use nonfat, on the theory that I can indulge in some of the recipes which follow if I skimp on fat elsewhere. Chai actually tastes better with low fat or even fat fat milk. Its your body, you decide. Stir the chai/milk mixture and heat it until it's nice and hot. Oh, yes. Add 7 heaping tablespoons of sugar before stirring. Or to taste. 7 tablespoons is my taste. When the chai is hot and stirred, it's ready. Yum! Some people would strain the chai before serving it. It has all sorts of pods and cloves and tea bags floating in it. I don't. Everyone in our household has gotten good at ladling chai and leaving the pods, sticks, seeds and slices in the pot. I do strain the chai when I'm putting it in a container to go into the refrigerator. I'll go that far. Chai is a great thing to bring to pot lucks. It will quickly enhance your social status, as it is hip and very chic, as well as foreign. A tip: Don't make the chai at home and carry it to the party. Take a very large pot and double the ingredients, carrying them to the event dry. Make the chai when you get there. It's safer. I won't tell you how we discovered this. See? Wasn't that easy. Cooking the Nathan way. Now for another priceless culinary adventure, or you can go back to the Recipe Directory. Or to the Little India article, if you came from there. Okay, this recipe is a fat free version of Jo Tapella's baste. Take an old quart mayonnaise jar, or a peanut butter jar, or something fancier if you have it. Fill it with 1/2 soy sauce and 1/2 lemon juice. (Hit Costco or Price Club for ingredients to this recipe.) Add 3 heaping tablespoons of lemon pepper seasoning, a couple of tablespoons of dried garlic, a handful of dried oregano leaves and a small handful of dried minced onions. All the measures here are approximate: I've been making it so long I do it by feel. The idea is: you should like the way it tastes. Alter the proportions to suit yourself. When you have a bunch of ingredients in the jar, shake it up. Refrigerate the marinate when you're not using it. Strictly speaking, you probably should wait a while before using this so that the dried onions fluff up. On the other hand, crunchy onions are good. If you're late getting dinner, do what you have to. Do you know how to baste things? This is good to know. I usually get out a plastic bag, left over from produce, and stick my object to be marinated in it. Then I ladle the baste over that, making sure that all sides of the object are covered. I seal the bag and put it in the refrigerator overnight, or on the sink for an hour or so. Voila! Tasty meats, or other things. Want a testimonial? 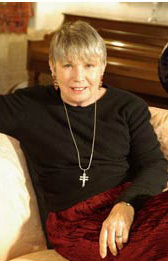 My mother-in-law, Celia Nathan, once tasted a piece of broiled chicken which had been marinated in my sauce. She said, "Sandy, this is the best chicken I've ever eaten." She became a macrobiotic vegetarian immediately afterward. This baste is great on fish, chicken and all sorts of meats. It's excellent for barbecued anything. Now, a really good Italian cook would make the baste with wine vinegar instead of lemon juice when cooking red meats. I say, "Who cares?" A container of this stuff is always on hand at our house. Our daughters are vegetarians, and we have found that you can even baste tofu in it! Yes––this marinade can turn tofu from a pasty white, gelatinous substance that the dog won't eat into a tasty, brownish gelatinous substance that the dog will eat. Try it! I don't have a picture of this cake, but thought you might like to see our dog. Yuki is a 13 1/2 year old Great Dane/Lab mix. Isn't she adorable? This recipe comes courtesy of our dear friend Mollie, who lives/lived? at the Lupin Lodge, a naturist club in the Santa Cruz Mountains of California. I will not get into what a naturist club is, but I will say they were at ground zero during the 1989 Loma Prieta earthquake. This was a 7.1-on-the-Richter-scale whopper that almost had me moving from California. Lupin was almost completely destroyed, all but this recipe. Mollie actually stole this recipe from a fancy cook book by James Beard or Julia Child or some such person. This is a serious, serious fruit cake for people who hate fruit cake but love anything irresistibly good. It has no (!!!) disgusting green , yellow or red things in it. Only real dried fruit. The ingredients are so expensive that, like the chai, it will bankrupt you unless you've got a Costco or Sam's Club close by. To reduce the cost, you can substitute ingredients, using walnuts for pecans, old sponges for apricots. No, don't do that. If you can't afford this, just keep the recipe and treasure it, imagining what all the ingredients taste like when blended and baked. Filling the kitchen with wonderful odors. Tantalizing your mind. Satisfying you deeply. Do you sew? I used to sew. I made most of my clothes for many years, until they invented Marshall's and Ross Stores. Then it became stupid to sit for hours making clothes that fit and looked good when you could spend the same amount of money and quickly buy stuff that no retailer could sell. Anyway, I used to sew. Those who sew will know what I'm talking about here. When I sewed, I had a huge stash of patterns and laces and other "findings" that I would use if I were ever making a dress for Queen Elizabeth or going to a coronation. Knowing I had drawers full of that stuff made me feel full inside, wealthy in a way that really mattered. I talked to a sewing friend and found she felt the same way: Those patterns for kilts and pajamas and superman costumes that no one in their right mind would ever use were riches. This recipe is like that. For years, I made this cake every Christmas, sending it across the country to relatives and friends who wouldn't dream of eating regular fruit cake. My macrobiotic in-laws, normally disciplined in all things food related, stashed the cake in their freezer, pulling it out for nocturnal nibbles. Hoarding it all year. Not even acknowledging to each other their furtive partaking of the mostly forbidden (to macrobiotic vegetarians) fruits. This is that kind of cake. I haven't made it in years, becoming lazy, in addition to surly, with age. Still, I'd never give the recipe up. Just having it is money in the bank. Here it is: Mollie's Fruit Cake. Of course, it's no longer Mollie's Fruit Cake the way I make it. The original recipe went: "Take 1/8 cup of flour and 1 egg. Cream them with 1 tablespoon butter. Add a pecan. Do this 1,223 times. Combine ingredients in alphabetical order. Make your own baking dishes with clay, fire them at 1000 degrees Fahrenheit or Centigrade." You get the idea-- needless fussiness. Needless complication. Dump it together, I say. It ends up the same in your stomach! Put apricot halves, pitted dates and dried figs through a food processor to slice. Place in a large container and mix. How large? I use a canner-- the biggest pot I've got. You're probably realizing that this makes a lot of cake. It does: 13 pounds. Enough to share with everyone you know. Looking at the dried fruit list, I realize that I always added a few other types of fruit. Can't remember what, just never that sticky mix with the green things in it. If you find a package of dried fruit that looks good and isn't shown, hey, it's your cake. You can put whatever you want in it. Mix batter ingredients with your food processor. You'll have to make several batches. I put about an equal amount of wet and dry stuff in each batch, and don't try to get equal amounts of ingredients in each. Dump the batches on top of the fruits and nuts previously placed in the very large container. Stir everything until it's well mixed. Consider stirring your aerobic exercise for the month––or rent a small cement mixer. After mixing the ingredients very well, fill greased and floured, or pan sprayed, tube pans, molds, bundt pans, etc. (as many as you've got) about 1/2 to 2/3 full of batter. The official recipe says to bake at 250 degrees for 2-1/2 to 3 hours. I find that one hour at 350 is fine. (You should probably check this pretty often, as you have invested your childrens' educational fund in this cake.) The cakes should look browned and pull away from the pan slightly when you take them out. Allow to cool in pans about 15 minutes. Run a knife around all edges and turn the cakes out onto racks to cool completely. The following step is optional. I am including it to show how open minded I am. When the cakes are cooled, you can put them in cookie sheets or other rimmed pans and pour brandy over them. I used to put a full quart bottle over the mess. When they'd absorbed as much brandy as they could, I'd wrap the cakes in Saran wrap and refrigerate them. I don't do this any more. I find the nonalcoholic version of the cake is just as good. But you can ruin the cake's pristine purity by defiling it with alcohol, if you must. The cakes keep refrigerated for a long time, and will freeze much longer. If you can avoid eating them. Note that this recipe is primarily just wonderful. It has no socially redeeming food value. It's neither Weight Watchers approved nor doctor approved. (10 eggs? A pound of butter? Cream? A package of brown sugar?) This cake is simply delicious. Rich. Full. Satisfying. Voluptuous. 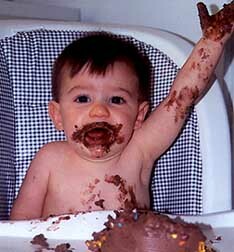 At last a man who's man enough to be photographed while eating the cake. Unleash your primal self. Do not be afraid. Okay. Now we're getting serious. This looks like an ordinary chocolate cake. It is not. By some mysterious alchemy, this cake is hardwired into the male nervous system to produce the most incredible response. It's probably hormonal, or maybe from the reptilian brain, or the early evolutionary history of humanity. Here's the secret: If you feed this cake to a man, he will love you. It's true. I feed it to my husband all the time, and he loves me. So, if you're trying to attract a man, this is the recipe for you. I was going to say, "For those gals out there trying to attract a man...." But I realized that a number of variations on that theme are currently popular. Speaking of variation, have you ever read the personal ads? Well, I don't usually indulge in such forbidden pleasures, but one night, I was up late. All alone. My will was weak. I happened to drift to the rear of our local rag, the Santa Barbara Independent. I suffered a not very momentary lapse of character and read the personals. After a few minutes I went, "Uggh. This is disgusting. And what do all those initials mean? What's "****"? I've never heard of that. I can't imaging advertising to "****" in a public newspaper. "****"ing with strangers?" I scratched my head and read some more, thinking, " On the other hand, if I was going to "****", I certainly wouldn't do it with anyone who knew me." Later, I thought "Have these people no shame? Don't they know what can happen? About the danger, the disease....?" Please be aware that we are presenting this recipe as a service to humanity. You see, if you make this cake, you will never have to place a personal ad again. You can merely walk through the shopping mall of your choice, carrying the uncovered cake, and men will want to "****" you unbidden. Maybe women, too. I haven't tried this, being too chicken to do anything but write about it. Here's the recipe: It came from a magazine long ago. I forget which one. The original ingredient list bears adjectives like "Blue Diamond" almonds, and "Jell-O" pudding, so I guess these companies concocted the cake, not realizing what they were doing. 1 package (4 serving size) chocolate instant pudding mix. It's deceptive, isn't it? Such simple ingredients. What they do. Okay. Do this: Put the almonds in a pan. Roast them at 350 until they're nicely brown. Maybe 10 minutes. This part is crucial. Do not go ride your horse now. The cake is very good if the almonds are a little too toasted, but you have to take them out before they go all the way to charred. They taste like burnt pencils if you do that, spoiling the effect. While the almonds are toasting, take a couple of bundt pans and spray them with pan spray. The original recipe calls for a well-greased, 10 inch tube pan. I found that if I'm planning on taking this cake away from home, say to go to the mall––no, to a girlfriend's house, I need to make two cakes. My husband will not let me take this cake out of the house unless I also make one for him. After you're done toasting and spraying, dump the pudding mix and the cake mix in a large mixing bowl. Now, the quality of the ingredients determines the quality of the outcome. This is no time to skimp. Buy the highest quality mixes you can. "Ultra rich, fudge, devil's food cake" is a good bet. Make sure they haven't snuck pudding in the cake mix already. That makes a too stiff cake, which we don't want. Also, do not use sugar free pudding. It gets bitter with baking. Throw in everything else but the almonds and the chocolate chips. Did you check the almonds, by the way? Brown, but not too brown. And a note on the sour cream: I've made this cake with everything from nonfat sour cream to nonfat raspberry yogurt sweetened with Nutrasweet. They all work, but again, quality counts. If you're serious about avoiding the personals, I'd use fat sour cream. Beat the ingredients for 4 minutes at medium speed with an electric mixer. It should be really stiff. Stir in the chips and almonds. This cake is delicious raw-- I always eat at least 1/2 cup. Try it. Pour the cake into one or two pans and bake it at 350 for about 70 minutes for one pan. I can't remember how long I bake two pans. Try 1/2 hour and keep checking. Don't under bake this or it comes out like one of those jell pads you put in the freezer for when you sprain you ankle. It's done when it pulls away from the pan and doesn't indent much when you poke it with your finger. Cool it in the pan about 15 minutes and remove cake(s) to racks, or remove immediately, as you will. I've done both. It's great just plain, or garnish it with whipped cream. For absolute decadence, I have frosted the cake with the highest quality chocolate frosting mix I can find. This is extreme––best reserved for special occasions and fertility rites. My husband says to tell you he likes this cake either frozen or heated so that the chocolate chips ooze nicely. So that's how I serve it. You've gotta please your man, right? All you folks who came straight to this recipe might want to go back to the Recipe Directory now and check out the rest. ALL OF THE BOOKS BELOW ARE WINNERS OF MULTIPLE NATIONAL AWARDS!